Under the direction of substitute music teacher Ms. Julie Mefferd, Denair High School and Denair Middle School band students began practice this week. 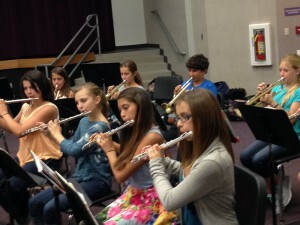 Within two days of the start of the school year, students already had instruments in hand. Denair High School band, which currently has 21 students, began warm ups immediately. Student Band President, Andrew Knapp, said many band students felt rusty after not playing their instruments over the summer. He led warm-ups the first two days. Ms. Mefferd commented last week that the high school band is ready for Pep Band performances at home football games, the first of which is August 29, 2014. The band is polishing its “Imperial March” song from the movie Star Wars and rehearsing “The Star Spangled Banner” which they plan to perform at half time of the Homecoming Game October 24. 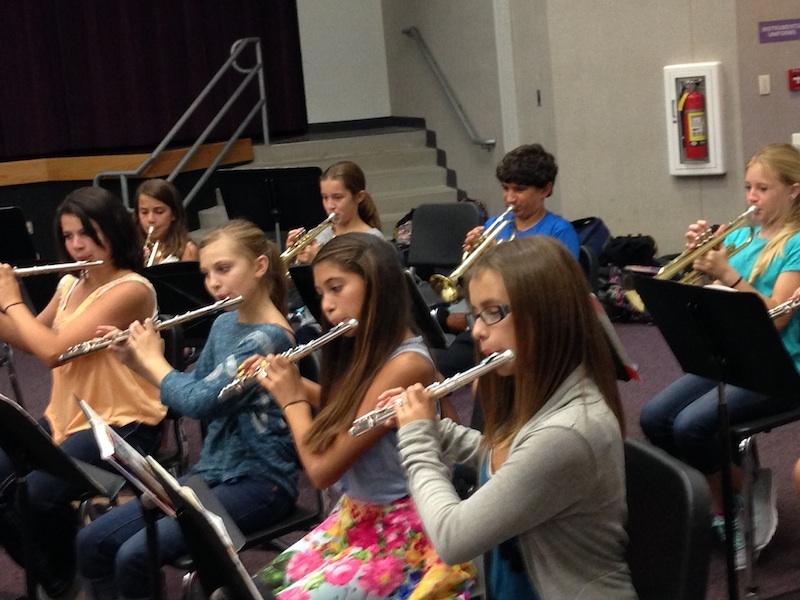 Middle School Band, which has approximately 50 students, began practice last Wednesday. Ms. Mefferd set the students in concert formation and began sectional warm ups on a practice piece. Students continue to work on fundamentals. Those who have their own instruments are encouraged to bring them everyday. On August 19, 2014, Denair Unified School District hired retired band director Mr. Donald Thissen, to replace Ms. Cathy George, who left the district this summer. Mr. Thissen, an accomplished trombone player, has taught music K-12 including jazz and concert band and marching band. Posted in News and tagged band, Denair High School, Denair Middle School, DUSD. Shana Michele Silva liked this on Facebook. Geri Arndt liked this on Facebook.